Re: UK Election Count - Beware Vote Rigging - statement on DUP deal "in error"
‘Theresa May’s bid to do a deal with the Democratic Unionist Party to save her premiership has been plunged into uncertainty. ‘A beleaguered Theresa May is facing a backlash after agreeing an outline deal with anti-gay Democratic Unionists to save her premiership. Conservatives spoke out after a senior party figure was sent to Belfast seeking a deal that could have seen the DUP handed ministerial jobs, with one Tory telling The Independent it meant being “pushed out to the right”. In the end, no formal coalition was agreed. But a “confidence and supply” arrangement was struck for the DUP to back the Tories on key votes. The Cabinet will discuss it on Monday. Theresa May will appeal to her MPs to throw their weight behind her at a crunch meeting on Monday, as her future hangs in the balance after the Conservatives’ majority was wiped out in Thursday’s general election. ‘Labour Party Leader Jeremy Corbyn has advocated for the cancellation of US President Donald Trump’s visit to the UK, citing disagreements over the Paris climate accord and the President’s criticism of London Mayor Sadiq Khan. ‘Supporters of the Democratic Unionist Party (DUP) are demanding Theresa May allow a banned loyalist march as part of an agreement by the Northern Irish party to prop up a minority Conservative government. The Portadown Loyal Orange Lodge (LOL), who are currently prevented from marching in the flashpoint Gavaghy Road following a long history of sectarian violence, put out a statement amid speculation as to what concessions the DUP could demand in return for striking a deal with the Tories. ‘The PM faces a showdown with Tory backbenchers and the DUP leader as she fights to survive in Downing Street. Theresa May’s new Cabinet is meeting for the first time since the election, with some ministers poised to demand a softer Brexit policy. The Irish prime minister Enda Kenny has issued a warning to Theresa May over her plan to do a deal with the DUP . If this played a part in her decision she qualifies for life membership of Naivety Anonymous. ‘Theresa May reportedly called her doomed snap election after being told to by Jean-Claude Juncker. The European Commission chief pressed the Tory leader to go to the polls amid concerns her slim majority would hold up Brexit talks. But the gamble backfired spectacularly and Mrs May is now barely holding on as Prime Minister after her majority was wiped out. Although she appears determined to limp on in government anyway and is set to meet DUP leader Arlene Foster on Tuesday to thrash out a deal to get the all-important backing of her ten MPs. The revelation is a fresh humiliation for the PM, who called the election to beef up her majority to ‘strengthen her hand’ in Brexit talks, but was punished by the electorate in the ballot box. ‘Labour and Conservative MPs have reportedly met for secret talks amid growing pressure on Prime Minister Theresa May to take a cross-party approach to Brexit in light of the hung Parliament following the general election. Ms May, who is working to form a minority government with support from the Democratic Unionist Party (DUP), is being urged by many Labour MPs and some members of her own Cabinet to pursue a so-called soft Brexit, where concessions could be made for access to the single market. Re: UK Election Count - Beware Vote Rigging - Rupert Murdoch ? ‘The Prime Minister is facing demands to say whether Rupert Murdoch asked her to appoint Michael Gove to the Cabinet. In a letter to Theresa May, deputy Labour leader Tom Watson said it had been “suggested” to him that Mr Murdoch, owner of The Times and The Sun, had lobbied the PM for Mr Gove’s return to front-bench politics. Ms May sacked the now-Environment Secretary last year when he was serving as Justice Secretary, having previously headed the Department for Education. ‘Theresa May’s new partners the Democratic Unionist Party has links to loyalist paramilitary organisations in Northern Ireland. But the links are not all in the distant past of the Northern Ireland ‘troubles’. In 2015 – just two years ago – the loyalist paramilitary group the UDA attacked a community worker with hammers in his home in front of his wife and children. His crime? Objecting to paramilitary thugs taking over community facilities in his village. Re: UK Election Count - Beware Vote Rigging - Civil War in N.Ireland ? Will Tory-DUP deal reignite Northern Ireland’s Catholic-Protestant tensions? ‘Northern Ireland’s Protestant Orange Order has urged the Democratic Unionist Party (DUP) to use its newfound political influence over Tory Prime Minister Theresa May to get a ban on its controversial annual march lifted. The DUP, which has close links with the Loyal Orange Institution, is reportedly under pressure to use its new kingmaker role to extract concessions from the Conservatives. The Orange Order is a masonic-style, hyper-conservative religious and political organization which grew out of Northern Ireland’s centuries-long sectarian conflict. The DUP itself was at the center of a bloody sectarian divide during Northern Ireland’s Troubles – a conflict involving rival paramilitary groups and the British Army which claimed more than 3,000 lives over 30 years. Read more: Will Tory-DUP deal reignite Northern Ireland’s Catholic-Protestant tensions? ‘The European Parliament’s chief Brexit negotiator, Guy Verhofstadt, says EU officials are growing “impatient” with the British government, as they wait for its negotiating position following last week’s snap election. In a tweet, Verhofstadt said the “current uncertainty cannot continue” after the UK’s June 8 general election resulted in a hung parliament and left Prime Minister Theresa May scrambling to form a minority government propped up by the Democratic Unionist Party (DUP). May’s humiliating loss of a Tory majority means she is likely to adopt a softer negotiating stance to win support in a House of Commons hostile to a ‘hard Brexit’ and to make sure the DUP gives her the backing she needs. ‘French President Emmanuel Macron says “the door remains open” for Britain to change its mind about Brexit, after talks with Theresa May in Paris. Mr Macron threw out the olive branch, even amid rising EU anger about the delays to the exit talks – which he said should be “launched as soon as possible”. “Of course the door remains open, always open until the Brexit negotiations come to an end,” the President said, when asked if Britain could yet stay in the EU. ‘“The crisis”, the economist Rudiger Dornbusch once noted, “takes a much longer time coming than you think. And then it happens much faster than you would have thought.” A similar dynamic describes the progress of Conservative austerity politics. The stunning failure of Theresa May in last week’s general election signalled to Tory MPs that the public have had enough of spending cuts. Though the deficit still stands at £50bn and the national debt is £1,700bn (and rising), austerity is over, we’re now told. Re: UK Election Count - Beware "Internet Clampdown"
‘The government could push through extreme internet regulation while people are distracted by the current political situation, according to activists. Theresa May might use her wide-ranging plans for technology – which includes weakening security and increasing censorship – as a way of restoring some of “image as a tough leader”, the Open Rights Group has warned. The prime minister might look to automatically censor the internet, for instance, and weaken security in a way that “could put all of us at a great risk of crime”, it said. ‘Theresa May will face Cabinet resignations if she gives in to demands from Philip Hammond to water down Brexit, senior Tories warned last night. The Chancellor will use a major speech in the City tonight to set out his vision on Brexit, amid mounting speculation he is pressing Mrs May to compromise in talks with Brussels starting next week. The leading figure in the Remain campaign told his German counterpart this week that the Conservatives had been punished by young voters for their stance on Brexit at last week’s election. Sinn Fein accused Theresa May of breaching the Good Friday Agreement today as she seeks a deal with the DUP to prop her up in power. 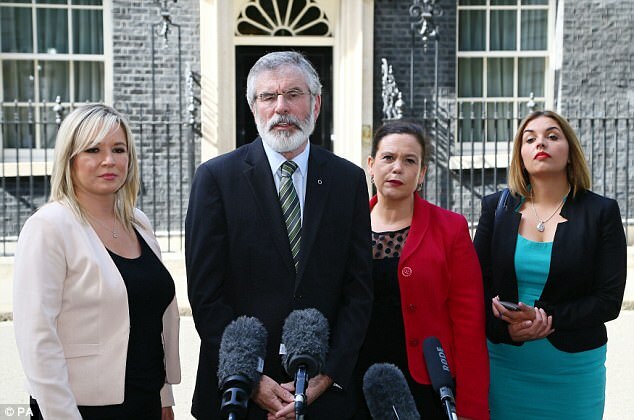 Gerry Adams, president of the Republican party, said he had told the PM 'very directly' during talks in Downing Street this afternoon that she was undermining the peace deal. But he also appeared to hint that Sinn Fein was not implacably opposed to an agreement going ahead - as long as it means significant new funding for Northern Ireland. Mrs May hosted Sinn Fein, the DUP and other parties at No10 in a bid to restore the Stormont assembly after its acrimonious collapse in January. She insisted after the talks her Government remained committed to restoring full devolution to the province as soon as possible. However, the situation has been complicated as she is also seeking to secure her Commons majority with support from the DUP's MPs after a disastrous election campaign. ‘Theresa May heckled as she unveils £5m cash fund and dozens of demonstrators scuffle with police.